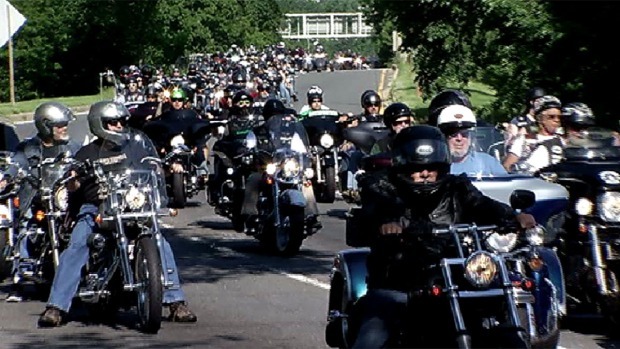 For the 30th year, the annual Rolling Thunder "Ride for Freedom" rumbled into Washington with hundreds of thousands of bikers. Since 1988, thousands of bikers and spectators have converged in Washington to honor military veterans and members of the military missing in action. More than 1 million people were expected to participate. Vietnam War-era veteran Bob Atkinson and his wife, Brenda Atkinson, said they were honored to ride in Rolling Thunder for their 17th year. They rode 900 miles to D.C. from their home in Perkins, Illinois. Bob Atkinson said he rides to "keep people aware that there's still people missing in action." "Until we get rid of that and treat everybody fairly and right, then the government needs to be aware, and this is one way that they're aware every year -- that people come here for this," he said. Being part of the huge wage of bikers approaching the National Mall never fails to make him cry, he said. News4's Chris Gordon rode on the back of retired Navy veteran Ken Gulledge's bike. Gulledge rode to D.C. from South Carolina and will return to Afghanistsn soon following 30 years of service to the Navy. "This is what I do. I defend freedom. This is the reason I'm on earth," he said. The official events started Friday evening, with the "Blessing of the Bikes" at Washington National Cathedral. On Sunday, thousands of bikers crossed Memorial Bridge onto Thunder Alley for the annual Ride For Freedom. They rode to the Vietnam Veterans Memorial to pay their respects. "My dad is actually on the Wall," said biker Vince Cobos. "I make it a point to come here every year. This is my tribute." Though the major events were Sunday, there are also events Monday, including a wreath presentation at the World War II Memorial at 9 a.m. There will be another wreath presentation at the Tomb of the Unknown Soldier in Arlington National Cemetery at 11 a.m. and for Vietnam War veterans at 1 p.m. The National Memorial Day Parade is set to start at 2 p.m.
For the full schedule, see the Rolling Thunder website. Expect major, rolling road closures. The closures for Sunday were all complete as of 6:30 p.m., but more closures could happen Monday. The NBC Washington traffic map will be updated throughout the day as roads open and close. Go here for the full Memorial Day weekend weather forecast. If you're driving a car this weekend, keep an eye out for motorcyclists even more than usual. “Even the smallest collision between a car and a motorcycle can be deadly for the motorcyclist," Officer Nathan Probus of the Prince William County Police Department told WTOP. The ride is open to anyone who wishes to show their support. Organizers recommend that all participants be experienced in riding in slow, stop-and-go traffic.